BACKGROUND: Attempts at transoral fundoplication to treat gastroesophageal reflux have until recently been limited to gastro-gastric plications. 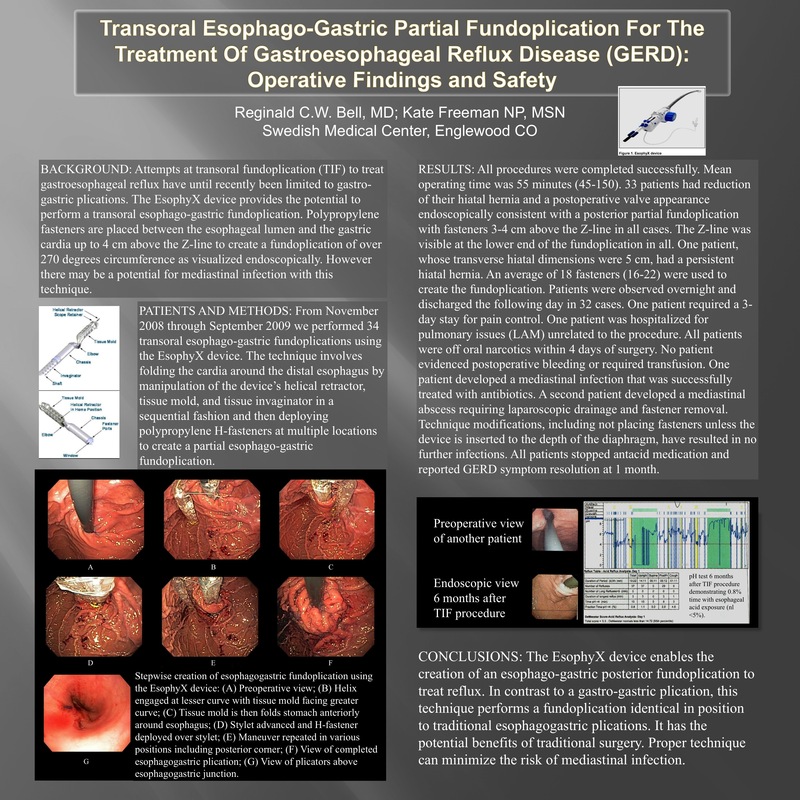 The EsophyX device (EndoGastric Solutions, Redmond, WA) provides the potential to perform a transoral esophago-gastric fundoplication. Polypropylene fasteners are placed between the esophageal lumen and the gastric cardia up to 4 cm above the Z-line to create a fundoplication of over 270 degrees circumference as visualized endoscopically. However there may be a potential for mediastinal infection with this technique. PATIENTS AND METHODS: Thirty-four patients were treated with transoral esophago-gastric fundoplications using the EsophyX device. The technique involves folding the cardia around the distal esophagus by manipulation of the device’s helical retractor, tissue mold, and tissue invaginator in a sequential fashion and then deploying polypropylene H-fasteners at 4 locations on the gastroesophageal junction. RESULTS: All procedures were completed successfully. Mean operating time was 55 minutes (45-150). 33 patients had reduction of their hiatal hernia and a postoperative valve appearance endoscopically consistent with a posterior partial fundoplication with fasteners 3-4 cm above the Z-line in all cases. The Z-line was visible at the lower end of the fundoplication in all. One patient, whose transverse hiatal dimensions were 5 cm, had a persistent hiatal hernia. An average of 18 fasteners were used to create the fundoplication. Patients were observed overnight and discharged the following day in 32 cases. One patient required a 3-day stay for pain control. One patient was hospitalized for pulmonary issues (LAM) unrelated to the procedure. All patients were off oral narcotics within 4 days of surgery. No patient evidenced postoperative bleeding or required transfusion. One patient developed a mediastinal infection that was successfully treated with antibiotics. A second patient developed a mediastinal abscess requiring laparoscopic drainage and fastener removal. Technique modifications, including not placing fasteners unless the device is inserted to the depth of the diaphragm, have resulted in no further infections. All patients stopped antacid medication and reported GERD symptom resolution at 1 month. CONCLUSIONS: EsophyX is the first device to enable transoral creation of an esophago-gastric posterior fundoplication to treat reflux. In contrast to a gastro-gastric plication, this technique performs a fundoplication identical in position to traditional surgery. It has the potential benefits of traditional surgery. Proper technique can minimize the risk of mediastinal infection. Postoperative pain resolves quickly. Short-term symptom control was excellent.